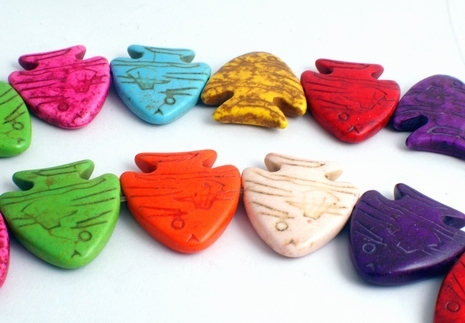 Price is per 16-inch strand of these unusual beads - about 18 fish beads per strand. Each measures a large 26mm x 23mm x 5mm - dyed, but color fixed. All drilled ready to thread - as picture. Ideal as a pendant or focal bead. To the Chinese fish represent wealth! Turquoise is porous, so contact with liquids, oils or even perspiration should be avoided. This is why its often impregnated with plastic, colorless oil or wax to improve color and durability. Jewelry should be removed before washing.